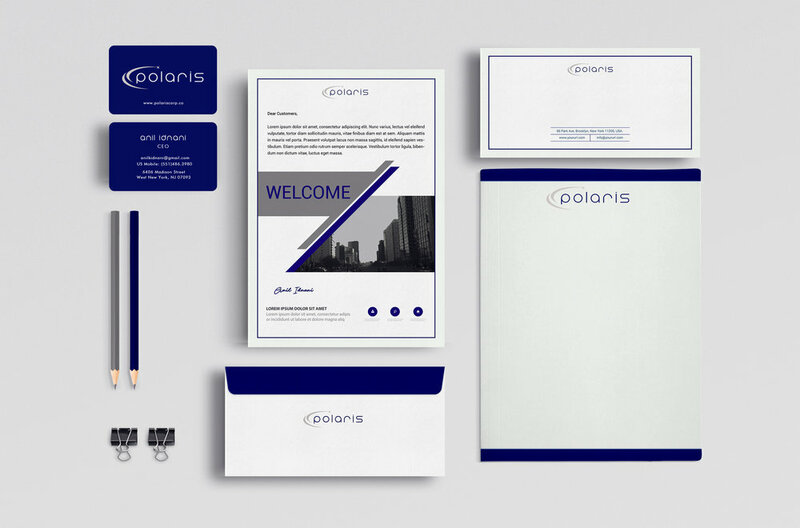 Polaris is a corporation that offers a diverse portafolio of services such as, real estate development, investment sales and others. To design the new brand, identity, logo and it's applications for the new corporation. Design a logo that will not blend or get lost with the corporation's competitors and/or colleagues.. I chose the constellation Polaris (Also known as North Star or Pole Star) as inspiration, since the company's core goal is to always point north. Polaris team is continuously moving forward, always following a path to success and providing innovative solutions for their clients. Also, since the corporation offers such a variety of portfolio services, I wanted to visually convey this as a constellation of stars. The idea was to make the logo modern, sophisticated, friendly and most importantly to make it stand out from it's competitors, therefore I chose a sleek, slightly geometric typeface and I designed an abstract graphic that represents the North Star. I selected navy blue and silver as my color palette since their symbology matches what the corporation stands for. Blue conveying importance, confidence, power and authority, as well as intelligence, stability, unity, trust, loyalty and wisdom. And silver representing clarity, awareness, focus, persistence, vision, strength and brightness.